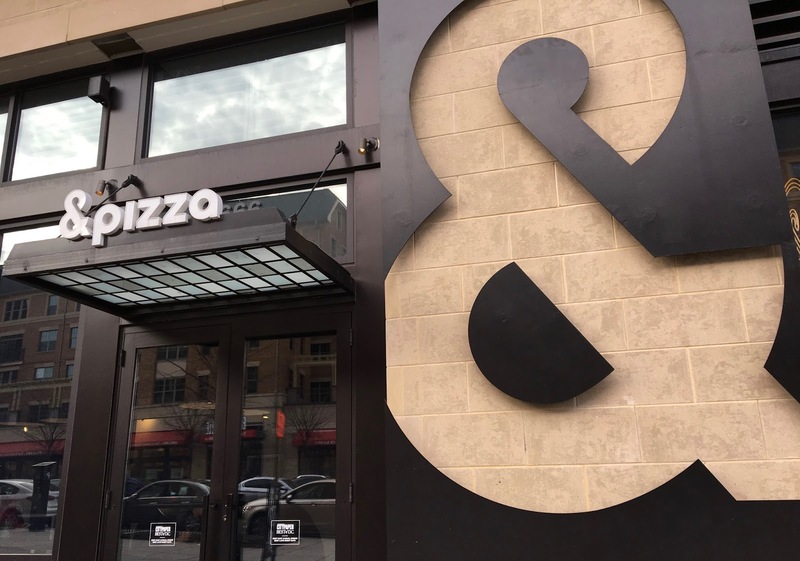 When it comes to pizza options in Washington D.C., it's hard not to miss &Pizza, the District's homegrown and hip fast-casual pizza chain. Self-described as the "anti-establishment establishment," &Pizza is built around a core value of creativity, and caters each store to reflect the ethos and individuality of their surrounding neighborhood. In the same way, &Pizza's creations are as unique as the customer ordering them, because one can choose the sauce, toppings, cheeses, and finishes that speak to them. Flair is the name of the game, and &Pizzas upend the status quo. I visited my local &Pizza shop is located in Brookland, located near the Catholic University of America and the Basilica of the National Shrine. It's been a while since I last enjoyed a good gluten-free pizza, so my hopes were high for this visit. It goes without saying that &Pizza is not gluten-free. They do serve gluten-full pies, and there is a chance of cross contamination. In fact, they do not recommend their pizza for those with "extreme gluten intolerances." That being said, I talked through my concerns with my local restaurant, and they accommodated me in a way I felt safe. Just because I had a good experience doesn't mean you will too, so be vigilant, and don't be afraid to speak up and ask questions. You are your best advocate! I decided to dine right when they opened (which is my usual move when dining out- there's a lesser likelihood of cross contamination when everything is clean and there's not a huge crowd). When I ordered, I let the staff know I was a gluten allergy order, and they happily changed their gloves and brought out a crust from the back. They put it on clean parchment paper on a pan, and when asked, they brought out a clean ladle for sauce. Once going through the oven, the staff transferred the pizza into a box, and offered to bring out a clean pizza cutter to slice it. I decided to op out of slicing (because I was heading home and would slice it there. Do note however that the gluten-free crusts come in one size, and they do contain egg whites, so if you have dual sensitivities, this crust is not for you. For toppings, I selected spinach, mushrooms, olives, egg (2, over easy), sundried tomato, pickled onions over spicy tomato sauce. I love that the toppings were generously portioned so that every bite had a bit of sweet, spicy, and salty that was totally satisfying. 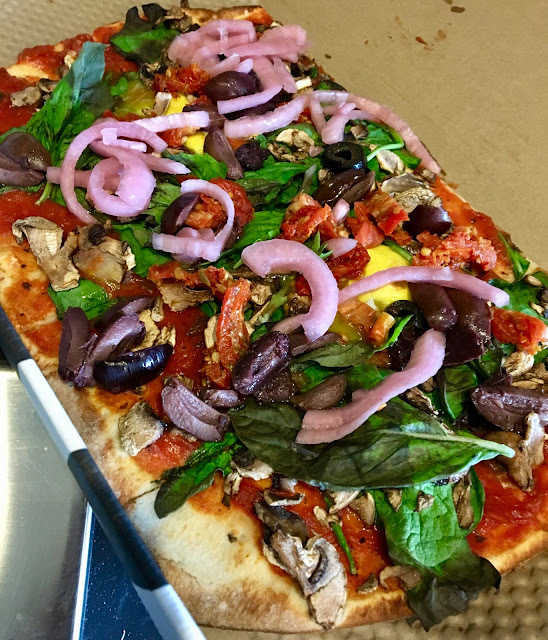 The bold flavors definitely impressed me, and atop a chewy, hearty crust, the pizza definitely belongs in the upper echelon of gluten-free pizzas I have eaten. The portioning of the pizza was perfect for me to eat in one setting. 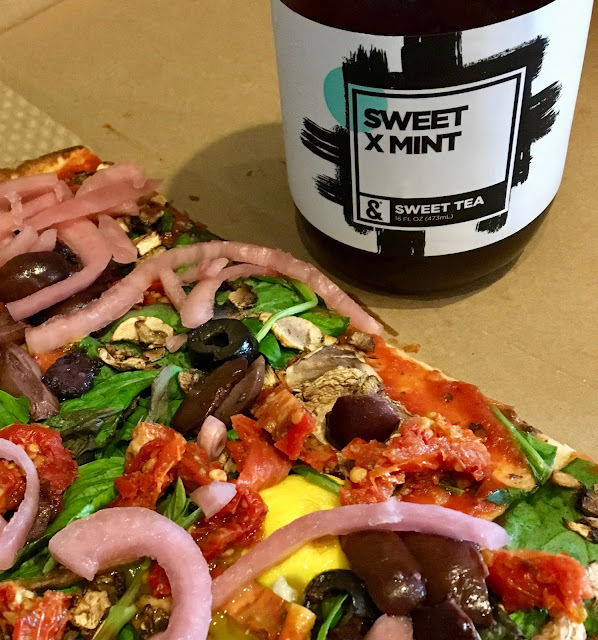 To pair with my pizza, I selected the Sweet x Mint Running Byrd Tea. I love this brand of locally brewed teas, and this variety is perfectly sweet with a bold mint flavor. Overall I had a good experience with &Pizza, but it was one where I recommend vigilance because cross contamination is definitely a concern. The day I visited the staff were willing to accommodate and were accommodating to my many questions, but that does not guarantee every location and staff member is equally so. What's great about &Pizza is that their pizzas are delicious and affordable- and are completely unpretentious. My pizza had good texture and bold flavors, which made this one stand out from the pack. Price: Craft-your-own pizzas start at $9.95 with a GF upcharge of $2.73. Special Feature: Download their rewards app and earn $10 for every $100 you spend.